Samsung has officially announced the first Windows Phone 8 smartphone today at the International Electronics Fair (IFA) in Germany. 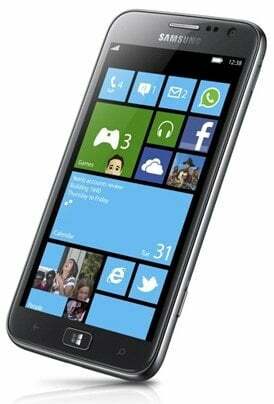 It’s called the Samsung ATIV S and it’s quite impressive. Although the name doesn’t exactly roll off the tongue, the ATIV S will be one of many new Windows Phone OS products from Samsumg including Smart PCs, tablets and of course smartphones. Samsung formally announced several of these devices at the IFA fair in Berlin including the ATIV Smart PC, ATIV Smart PC Pro, ATIV Tab and the ATIV S.
The ATIV S is the first smartphone ever to run the latest iteration of the Windows Phone OS, Windows Phone 8. It’s thin at 8.7 mm with a 4.8 inch HD Super AMOLED screen with a resolution of 1280 x 720. CPU-wise, the ATIV S packs a 1.5 GHz Qualcomm Krait dual-core CPU and 1 GB of RAM. Data speeds are expected to be good with HSPA+42. No word on LTE yet, however once the devices launch in the US it would be silly for Samsung to exclude the feature. Unfortunately, the release date wasn’t included in the announcement however I expect it around the date Windows Phone 8 is officially released on October 29th. It’s still interesting that Microsoft has went with Samsung for the first Windows Phone 8 device, not choosing Nokia, a company that has bet the farm on its new partnership with Microsoft.